Usually anyway. The meek become wild, the confident, shy and the arrogant become shadows. A mix of medication, neglect and the fact that you never knew if the person next to you was going to continue staring into space or leap up and attempt to gouge your eyes out meant that you became less than yourself. It sucked your identity away like a leech feasting on your soul. I, myself, have tried with everything I have to keep hold of my Self, or those parts I want to save, anyway. I don't know if I've been successful, though. I don't know if the Me now is anything like the Me who walked in here. The change can creep up on you, sneaking around, hiding in corners until you're not looking then BANG! You're no longer, entirely, you. Black curls, black eyes and black attitude. A smile that could slice your heart out of your chest. An innocence lost. Miriam was that way when she first appeared in the recreation room and she was one of the only people I knew who stayed that way until she left. Did they leave? Were they pushed? Did they disappear? Well, they were no longer here, that much was true. But sometimes the individual had neither improved nor deteriorated when they were, suddenly, absent. Miriam was one of those. Like me, I very much doubted she was crazy. Well apart from her tales of Mana. Apart from talking about some typewriter that could bend time and space and was a masterpiece of quantum physics, of course. Hey, people died because of me. At the toss of a coin, no less. But I kept my own issues to myself. I was paranoid (I told them). Miriam, however, was very vocal. From the day she walked in, she made sure you knew who she was and why she was here. Not that she believed she belonged in here, but not many did. I did wonder, though, on more than one occasion, if she was the only other non-lunatic in the asylum. She didn't seem crazy. There was so much conviction in her stories you felt she was actually telling the truth. As far as she believed it, anyway. Did that make her more crazy than the crazies? Or more sane than the psychiatrist. Considering Connors was the doctor in question, the jury is still out. Kidnap is a strong word. Strong is a strong word, too, isn't it? Words have meat, don't they. 'Strong.' 'Whisper.' 'Light.' Because you know their meaning you infer substance and weight to them in varying degrees. 'Kidnap' could pull you down like concrete overshoes in the river. Connors denied it, strenuously. The orderlies openly laughed in her face. The residents did both of those and threw some disbelief in for good measure. I was undecided. In the realm of Farfetched, I was King, so I had to take everything with a pinch of Lot's wife. But Miriam was insistent. She'd been kidnapped. Her horrible guardians' evil business partners, the Cartwrights? Cantrells? Anywho, they'd stolen her and her friend away and bundled them on a train. Of her friend there was no sign and I had to admit that I'd never heard the choo-choo of Thomas anywhere near here before. And then there was Mana, her Island governess. She could control people with her mind. But, did I mention people die around me? I may have. I forget. Hold on... Governess? Did people still have them? And Miriam had left her childhood behind long ago, anyway. Still. With her black curls, black eyes and black attitude, Miriam still made you feel she was whiter than the light that was inset into the ceiling of Room 101, the one that would blind you for a good half hour if you so much as happened to glance in its general direction. You, or at least I, felt that she hadn't quite learned the definition of deceit. Her innocence was lost, but its effect still lingered like Room 101's bulb. Maybe she told the truth. Perhaps she had been kidnapped and her friend was being held too, and her guardians were plotting with their business partners to do unspeakable things. But, as she's no longer here, I can't find out any more. I can't delve into her stories to see if there are any chinks - or discrepancies - in the armour of her conviction. Maybe she'll write me a letter on that grand typewriter she kept mentioning. It would be nice to receive a letter. Even if it is from another time. 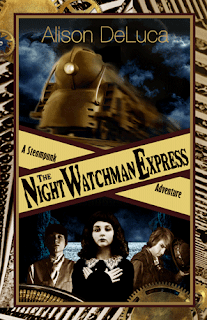 The NIght Watchman Express is indeed an interesting book to read. I read a part of it and is looking forward to finishing it. I thought it was a very good book! And wait until The Devil's Kitchen! !